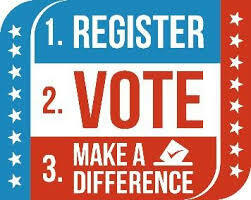 Tuesday, September 26 is National Voter Registration Day! Are you registered to vote? Did you recently move (change address), turn 18, get married (change your name), complete parole, or would you like to change your party affiliation? From 12pm-3pm on Sept 26, a table will be up at the Steele Memorial Library with voter registration forms. We can take completed forms to the Board of Elections of Chemung County. If you can’t make it during those hours, there will still be voter registration forms available at any CCLD library for you to fill in and mail in yourself. Click here for other ways to register. The next general election is Tuesday, November 7, 2017. Applications must be postmarked no later than October 13th and received by a board of elections no later than October 18th to be eligible to vote in the General Election. 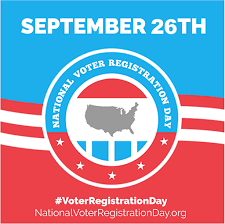 You may register at your local board of elections or any state agency participating in the National Voter Registration Act, on any business day throughout the year but, to be eligible to vote in the General Election, your application must be received no later than October 13th. If honorably discharged from the US Military or have become a naturalized US Citizen after October 13th, you may register in person at the Board of Elections up until October 28th. Notices of change of address from registered voters received by October 18th by a county board of elections must be processed and entered in the records in time for the General Election. An application to change one’s party enrollment for 2018 must be received by the board of elections no later than October 13th. On November 7, registered voters can decide whether NYS should hold a constitutional convention. The New York State Constitution mandates that every 20 years voters will be asked the following question: “Shall there be a convention to revise the constitution and amend the same?” The next referendum will be held on November 7, 2017. It presents a constitutional choice of profound importance; a once in a generation opportunity for the State to reinvent itself. We will not have this opportunity again for another 20 years. According to Vote411.org,The New York State Constitution requires that every 20 years the people decide if a Constitutional Convention should be held to consider amendments to the State Constitution. The purpose of this Ballot Question is to allow the voters of New York State to determine whether a Constitutional Convention will be held according to the procedure provided by the State Constitution. Click here to read more on the Constitutional Convention question. 2. Authorizing the Use of Forest Preserve Land for Specified Purposes. The proposed amendment will create a land account with up to 250 acres of forest preserve land eligible for use by towns, villages, and counties that have no viable alternative to using forest preserve land to address specific public health and safety concerns; as a substitute for the land removed from the forest preserve, another 250 acres of land, subject to legislative approval, will be added to the forest preserve. The proposed amendment also will allow bicycle trails and certain public utility lines to be located within the width of highways that traverse the forest preserve while minimizing removal of trees and vegetation. Shall the proposed amendment be approved? How is Chemung County doing in terms of people registered to vote? According to the NYS Board of Elections, there are currently 53, 584 registered voters of all parties in Chemung County (though 2,768 of those are labeled as inactive). The US Census data from 2016 shows that there are currently 86,322 people in Chemung county, 21.6% of whom are under the age of 18. That makes for 67,676 people who are able to vote. That means that 14,092 people in Chemung County are not registered to vote. Add that to the 2,768 inactive voters, that leaves 16,860. That is nearly 25% of people who could vote that are not voting. Click here to look up up NYS district maps and elected officials. This entry was posted in Beneficial Bits n' Bytes, Community by Maggie Young. Bookmark the permalink.